I read this book when it was first published and I still haven't found the right words to properly review it. As such, this review will be lacking, simplistic and will not do this book and it's fabulous author justice. 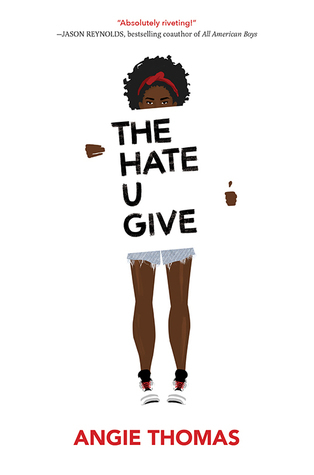 “The Hate U Give” a debut novel by Angie Thomas has rapidly climbed to the top of the NYT Bestseller’s List since its publication date this past February. Sixteen-year-old Starr lives in two worlds. One is her suburban prep school and the other is the poor neighborhood where she lives. The balance of these worlds is upended in one night when Starr’s friend Khalil dies at the hands of a police officer. Khalil’s death becomes a national headline and with Starr as the only witness, she must learn to use her biggest weapon, her voice. This book is powerful and honest. It strips away popular narratives that get splashed across the news channels and looks deeper into a community where tragedies like this occur all too often. Inspired by the Black Lives Matter movement, Angie Thomas’s debut novel is extremely timely and on topic. If you want to get an authentic perspective on some of the heart wrenching things happening in communities across the United States this book is a great place to start. I have no life experiences that could compare with anything Starr, her friends, family, or community went through in this book. Thomas wrote this book so well that I could feel myself inside the minds and hearts of her characters. This book should be used in classrooms. All I could think about after reading this story was of books forced upon me and others in school. Recently a retired teacher brought in her classroom books to donate to our collection (only our FOL group takes donations) and all my first thought after surveying her donations was, "These books are so WHITE." What are we really teaching our kids if we keep forcing them to read the same books year after year, never seeing people of color in the pages? One of my reading goals this year is for a majority of my books read to be written by people who are different than I am and have different experiences than myself, mainly #ownvoices authors. People of color, people of different religious backgrounds, and people who love differently. As a librarian I believe this is important and vital to my job. As a reader I believe it will hopefully help me to become a more empathetic and understanding citizen.